Lara doesn't yet need school shoes (though it won't be long) but at nursery I do like her to wear something comfy that won't get totally trashed within the first day of her wearing them. Lara has also inherited her mummy's enormous feet and we struggle to keep up with her ever-growing feet - she is a size 11 already and is only 3 and a half years old. Sigh. These Skechers Velocity Mary Jane Casual Shoes come in an infant size 10 all the way through to adult size 5. 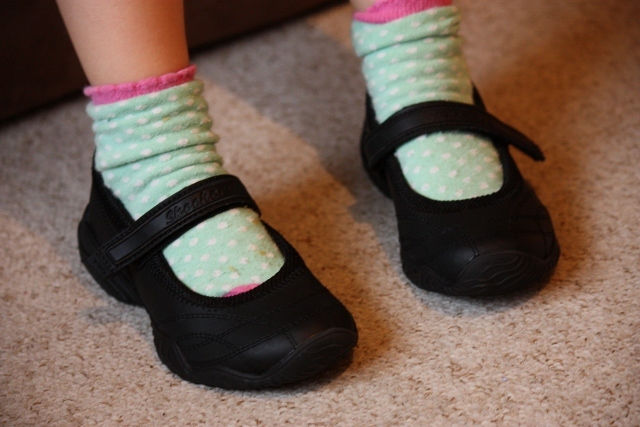 They have a really chunky, bouncy sole and a very simple velcro tab across the top which means that Lara finds it easy to put them on herself. I ordered Lara's shoes online from Barratts. As a website developer I am often a very harsh critic of retail websites but I can tell you now that the Barratts website was a dream to use. The menus and shortcuts just seemed to offer me everything I might need when looking for shoes for Lara and the registration and checkout process was one of the easiest that I have used in a long time. Our shoes arrived in mega-quick time (it was 2 working days after I placed the order). Lara at first seemed more taken with the free comic that came with the shoes (!) but once I convinced her to try them on, I think she was quite taken with them and was eager to show them off at nursery. She was especially excited when I told her I used to have some like it... it made her feel that little bit more grown up. Now that Lara's feet are a little bit more predictable in their size than they were when she was a toddler I am happy to buy shoes online, especially when I know that I can make a return very easily should I need to by taking the shoes to my nearest store. The Skechers shoes seem to have worked well for nursery and I'm hoping that it is a good sign for next autumn when we have to worry about school shoes!